"Yes! I AM the Angel Who Rolled Away the Stone! "Would you have Me roll back your stones of stumbling, your boulders of pride, your mountains of fear and doubt? "If the answer is yes, then call to Me! For I AM the roller of the stones that prevent the children of the Light and the sons and daughters of God from going straight to the mark of Sirius, to the Great Central Sun and to the Sun of Helios and Vesta. "Think now, as I speak to you, where have you erected boulders that you can no longer roll away because they have become so great? Is it not so, that an Angel must rescue even the Lord by rolling the stone away? 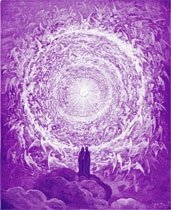 This is the meaning of the incomparable service of the Angelic Hosts of Light. We move - indeed, We move, as it is Our assignment - to care for the sons and daughters of God who are undergoing the Initiations of the Passion of our Lord. "If you would remove 10 percent of your pride, We would multiply the Light that you could use to consume the remaining 90 percent of your pride. Understand, beloved, that you must play your part and not sit back and wait for your boulders of pride to remove themselves!" 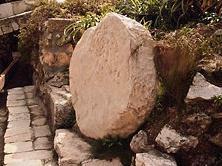 The Angel Who Rolled Away the Stone from the tomb at Jesus' Resurrection was the Archangel Gabriel. 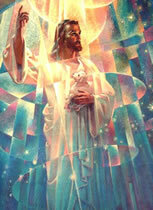 He spoke to humanity through the Messenger, Elizabeth Clare Prophet, on Friday, March 28, 1997 during the Easter Retreat. Preceding this discourse, the Messenger read an excerpt from The Prince of the House of David. Saint Germain instructed Edna Ballard to base the "I AM Come" Pageant in Shasta Springs on the information contained in these "Letters of Adina". Adina was a contemporary of the Master of Galilee and a past embodiment of Edna Ballard (now the Ascended Lady Master Lotus). This "pdf" text written by Joseph Holt Ingraham is a moving re-creation of Adina's eyewitness accounts of Jesus' Ministry: "When we reached the tomb, with our spices and precious ointments, to embalm the body, we found it open, and the soldiers, who had guarded it, lying about upon the ground like dead men. Upon the stone sat the Archangel, but the resplendent Light of His apparel and countenance was so tempered to our eyes, that, although we believed that it was an Angel, we were not terrified, for His looks were serene, and the aspect of His face Divinely beautiful, combined with a terrible and indescribable Majesty. We shook with fear, and stood still, unable to move, gazing on Mim in silent expectation. . . ."
Angel Who Rolled Away the Stone, March 28, 1997, Pearls of Wisdom ®, Volume 40 Number 28 (The Summit Lighthouse, 1997) Copyright © 1997 Church Universal and Triumphant, Inc.